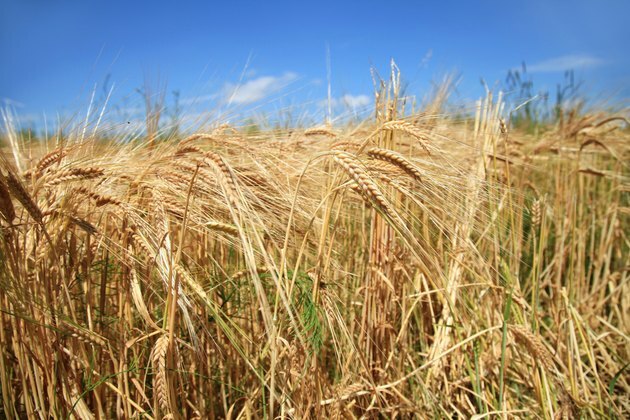 Vital wheat gluten -- the natural protein found in wheat -- boosts dietary protein and fills an essential role in baking. Most people can consume wheat gluten without thinking twice, but if you have celiac disease, a wheat allergy or you're sensitive to gluten, you'll need to keep vital wheat gluten out of your diet. Other proteins and gums provide similar qualities. The substitute you choose depends on how you use it. Xanthan gum, which is produced by fermenting the bacterium Xanthomonas campestris, is a good substitute for gluten-free baking. Gluten adds elasticity and strength to dough. It also traps gas, which causes dough to rise, and improves texture in the final product. Xanthan gum duplicates all of gluten's effects. Use about 1/2 teaspoon of xanthan gum for every cup of flour when you’re baking quick breads and 3/4 teaspoon per cup of flour for yeast doughs, recommends Colorado State University Extension. Replacing gluten in baking is not an exact science, however, so you may need up to 1 teaspoon of xanthan gum per cup of flour. Guar gum comes from complex carbohydrates inside the seed of the guar plant. The ability of guar gum to prevent crystallization in frozen foods such as ice cream and add thickness to soups and dairy products makes it a favorite additive in commercially produced foods. Like xanthan gum, it contributes strength, moisture and volume in baked goods, but guar gum doesn’t provide quite as much elasticity. For this reason, xanthan gum is a better choice for yeast-based baked goods. Use about 1/2 teaspoon to 1 teaspoon of guar gum for every cup of flour. Eggs add high-quality protein to your diet. One large egg has 6 grams of protein, or 13 percent of the daily value based on consuming 2,000 calories daily. You can eliminate all of the fat and cholesterol if you use egg whites, and you'll still get 4 grams of protein from one egg white. Eggs bind ingredients and stabilize structure in baked goods. Egg proteins also trap air during baking, which helps dough rise. Whole eggs are better for gluten-free baking because fats in the yolk contribute moisture and texture. If you use vital wheat gluten as a source of protein, go with protein powder as a replacement. Most protein powders contain 20 to 24 grams of protein per scoop, which is about 1/4 cup of powder, reports the University of Michigan. Protein powders are versatile and easy to work into your diet. You can mix unflavored or vanilla powder into yogurt, oatmeal, pancakes, burgers or a cup of coffee. Start with a small amount of powder and add more until you reach a palatable flavor and consistency. Protein powders can replace some of flour in baked goods, and whey protein powder improves texture and moisture. Otherwise, they do not replace vital wheat gluten in baking. If you're intolerant of wheat protein, check protein powder labels to ensure wheat gluten isn't an ingredient.